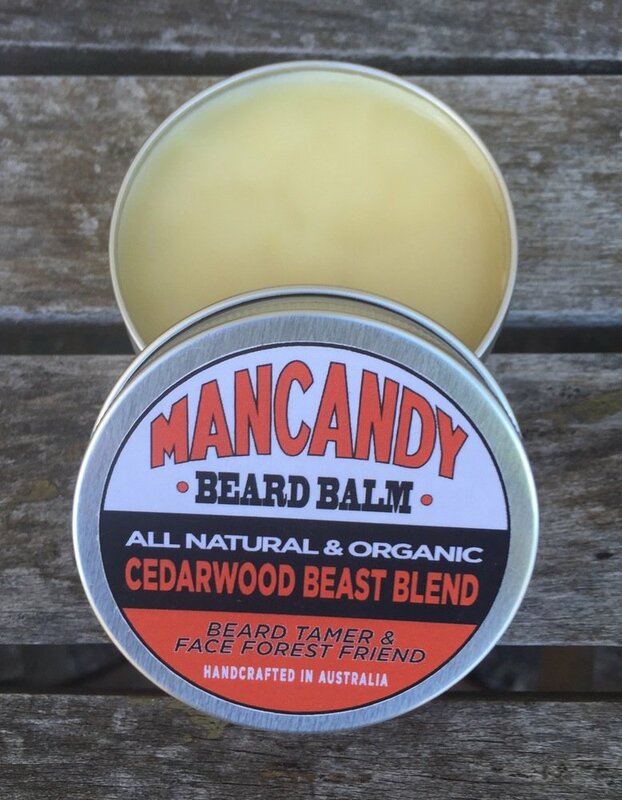 I have been using ManCandy ‘Cedarwood Beast Blend’ Beard Balm who are based in Sydney, Australia. I have said before in a few reviews that I’m not keen on Cedarwood, I have however liked a couple of products that had Cedarwood perfectly balanced with other essential oils and so I approached this test with trepidation. One of the down sides of testing is that if something isn’t to your liking, well its tough and you have to push on with the test. However I actually like this and I have to withdraw my “I don’t like Cedarwood” statement, it’s not that this isn’t a strong Cedarwood, I wouldn’t say it was a powerful smell but it has a firm woodsy scent and is clearly Cedarwood. ‘Cedarwood Beast Blend’ Beard balm is made from Argan, Jojoba, Sweet Almond, Camellia and pure essential oils plus shea and cocoa butters with a tangy lime scent. The essential oils aren’t listed on the website but Micko did tell me what was in ‘Cedarwood Beast Blend’ and it’s a blend of seven essential oils and I wouldn’t have guessed those oils but they work well because it just gives the Cedarwood an extra layer of scent that works very well. ‘Cedarwood Beast Blend’ gives your beard a nice hold and will keep your beard looking good all day, it left my beard feeling soft and smelling good and this giant 60ml tin will keep your beard looking good for a while, the balm is also easy to scoop out and work with. Citrus Sasquatch – Argan, Jojoba, Sweet Almond, coconut and pure essential oils plus shea with a sweet citrus scent. Spicy Pirate Blend – Jojoba, coconut, Argan, and pure essential oils plus shea with a spicy scent. You really can’t go wrong with this balm, it’s a very good balm and $20 at the current exchange rates is only £10.33 and that is an incredible deal. Mancandy Beard balm began in early 2015 by a funny bloke with a love for his BEARD. Our products are MANcrafted in Sydney, Australia and made to order with the highest quality ingredients on the market. We don’t use any cheap filler oils, synthetic fragrances or preservatives. Our natural recipes have been MANlovingly made by hand and MANtested on real beards throughout the harsh Aussie climate. Mancandy products will keep your chinrug in tip top shape. MANCANDY, GET IT ONYA BEARD!